When I offered a makeup how-to for stressed out skin last week I briefly mentioned that the cause of my face mishap turned out to be Biotin, the supplement I've been taking for months. I was surprised at the number of emails I got from readers telling me their own Biotin horror stories. I had no idea. If you're not familiar with it, Biotin (link goes out to Wikipedia) is Vitamin B7 (also known as Vitamin H), and common wisdom links increased intake of it to improved hair and nails. Especially the latter. I started taking extra Biotin (there's some in my multi-vitamin and probably also in the Vitamin B supplement I add) last spring and saw results within a couple of weeks. Gone were the brittle nails that split just from looking at them funny. My nails became strong and healthy like never before. I can't report any effect the Biotin may have had on my hair, and that's a good thing. Any more of that and I'd look like Cousin It. I had six or seven months of uninterrupted nail bliss when some unrelated web browsing lead me to a number of testimonies linking serious skin breakouts with Biotin. At that point I've been climbing up the walls trying to figure out what was turning my happy and healthy skin into this horror show. It only started a few weeks prior, but it was painfully clear that this was not a random thing caused by testing an unsuitable beauty product. I quickly ceased using anything but the most basic skincare, eliminated everything I could from my routines, quit using hair masks and creams and reverted to Head& Shoulders -- it was none of the above. While I managed to keep things more or less under control (salycilic acid in doses I do not recommend to anyone), for every eliminated pimple I got another one almost right away. Then I quit taking Biotin, and two days later it was all over. Just like that. None of this is scientific or verified in any way. Wikipedia says that the data regarding Biotin as a hair and nail strengthener is weak, so just as nobody can make medical claims for the vitamin's good works we can't prove it's the culprit in the skinpocalypse I just experienced. All I can say is that I'll take my brittle nails any day over the alternative. 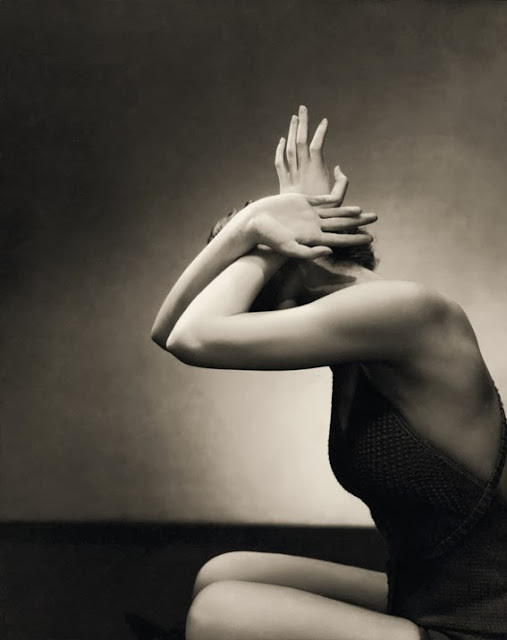 Photo by Edward Steichen, 1934. I had to comment of this because I believe I just got over a biotin reaction just now too. I was using a biotin shampoo and conditioner and for the first month it was lovely stuff. And then my hair started to fall out and my scalp became incredibly irritated. This happened for two months and I thought I was going nuts and tried to figure out what was happening finally my brain put two and two together and I stopped using the stuff. A day later after using the stuff my scalp feels better and hair loss stops. The product was Organix Biotin and Collagen shampoo and conditioner. A month has passed since I stopped using the stuff and my hair is back to its healthy full self but it was frankly scary. Wow, that's scary. I'm glad you figured out what was doing it. I just started taking biotin because my nails are crap, but if I start breaking out, will discontinue. Thanks for the PSA. My husband's a medical researcher and he thinks that taking any supplements, except maybe Omega 3, is not a good idea, as there has been very little good research done on their effects (positive and/or negative). Biotin makes me break out like crazy too. I have found silica/silicon drops to be a good alternative for strengthening fingernails/hair. I also found it seemed to slightly improve the quality/texture of my skin as well. I have the same experience as Anon above. I've fallen in love with Biosil. Same as anon above - Biotin was horrible for me but I've been taking Biosil drops for the past few months and am very impressed. Thank you for doing a follow-up post. I have had more than my fair share of breakouts in the last year and I also take Biotin, but didn't know of a connection until I saw your earlier post. I actually have a dermatology appointment this week (that I set up months ago - that's how long it takes to get in to see mine) and am going to ask her if there is any connection. There is a product I can recommend. It is called Derma Nail and it is sold through Amazon. It is expensive but it is worth it. If you want to see how it works, go to a nail blog called loodieloodieloodie and she will tell you all about it. It isn't a quick fix but it works. when your organs cannot filter and clear stuff, it shows up in your skin. sounds like your body did not need the supplement and was telling you so. have you considered building your qi through qi gong or acupuncture? it can help with imbalances that result in funky nails. i agree with the above poster's hubby - taking supplements is not such a great plan long-term, but in the short term, for instance, taking herbs to kick out a virus, they are fine. Biotin broke me out too. It didn't break me out too badly, but my once-a-month hormonal chin breakouts turned into every-day chin breakouts. I figured it was just my skin until I ran out & my skin cleared up immediately. Glad it's not just me! I have never tried biotin, but did break out when I tried Omega-3 supplements. The vitamin balance can be very tricky to figure out! How much water were you regularly drinking? I can't remember the science behind it, but there's something in biotin that can very easily break you out if you're not drinking enough water! Biotin didn't break me out and I take very high doses 5000/day. I had cystic acne as a teen and I'm clear now whether I take Biotin or not. I used OGX biotin shampoo and conditioner twice and both times it made my scalp irritable. I will Never believe the hype ever again.